Slow Art Day reaches over 200 venues! We’re excited to announce that Slow Art Day has reached a new milestone: over 200 venues have registered to host Slow Art Day 2013! As of this week, there are over 200 participating venues in 22 countries, 160 cities, and 5 continents. What started out as a grassroots movement has grown into a truly global initiative, and we want to take a moment to thank all of our dedicated volunteers, hosts, and participants for their help and support of Slow Art Day. To help celebrate this accomplishment, we’ve planned some fun posts across our social media channels emphasizing the theme of growth. On our Tumblr, our weekly “Themed Thursday” series is focusing on growth with artworks like Gregory Euclide‘s Otherworldly: optical delusions and small realities, 2011. 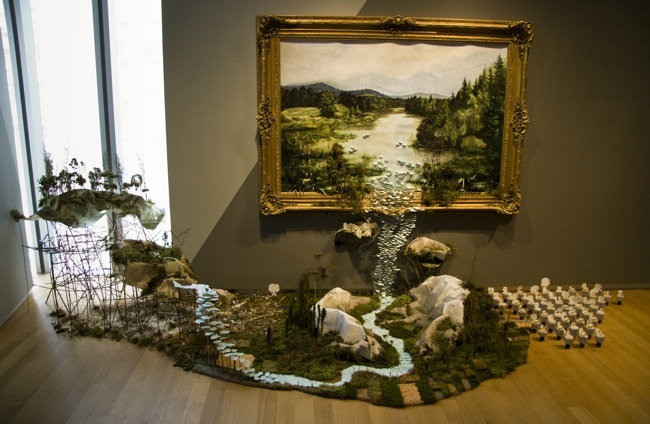 Gregory Euclide, Otherworldly: optical delusions and small realities, 2011. On our Facebook, check out another growth-themed artwork by Rogan Brown, and keep your eyes peeled on our twitter for a special tweet congratulating our 200th venue! Slow Art Day 2013 is just over a month away; how many venues do you think will register to host by April 27th? Let us know in the comments! There’s still plenty of time to sign up to host; click on the Be A Host tab at the top of the page to register. Once again, thank you to everyone who has played a roll, small or large, in helping make Slow Art Day such a success!